A billiard table was advertised for sale at Ashley Ferry in the Gazette. sufficient number of persons in health to attend the sick, and many persons perished from neglect and want. There was scarcely a house in which there had not been one of more deaths. Inoculation was at this time first attempted with some success and the disease soon after abated. 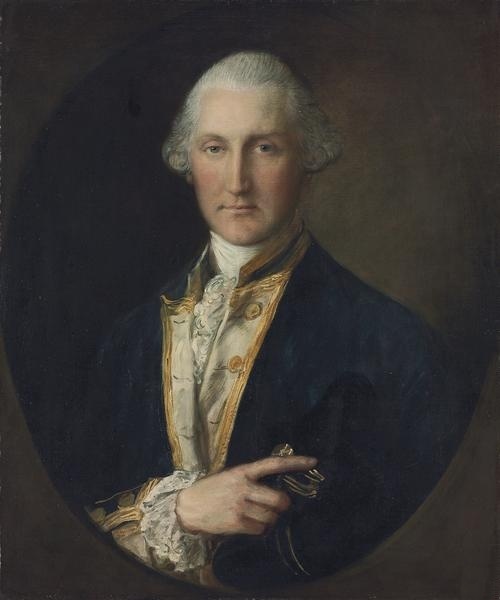 William Henry Lyttelton arrived in Charlestown as the Governor on the HMS Winchelsea. Crowds of citizens gathered to toast the new governor but Lyttelton’s term would be riddled with controversies. The Secret Committee of Five ordered the tarring and feathering of James Dealy and Laughlin Martin for rejoicing (supposedly) that Catholics, Negroes and Indians were going to be armed in an uprising against the people. The two men were carted about the streets and banished from town. Joel Roberts Poinsett was appointed the first United States minister to Mexico. 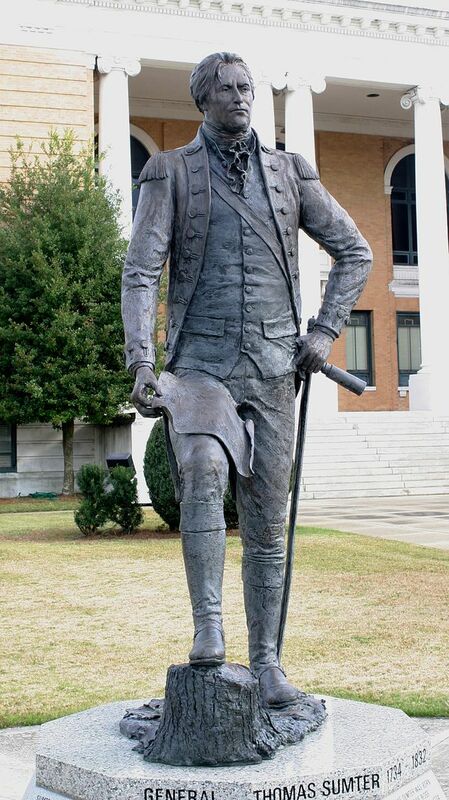 Statue of Gen. Sumter on the courthouse lawn, Sumter S.C.
Thomas Sumter died, the last surviving Revolutionary War generals. In February 1776, Sumter was elected lieutenant colonel of the Second Regiment of the South Carolina Line. He subsequently was appointed brigadier general, a post he held until the end of the war. Perhaps his greatest military achievement was his partisan campaigning, which contributed to Lord Cornwallis’ decision to leave the Carolinas for Virginia. Sumter acquired the nickname, “Carolina Gamecock,” during the American Revolution for his fierce fighting tactics. After the Battle of Blackstock’s Farm, British General Banastre Tarleton commented that Sumter “fought like a gamecock”, and Cornwallis paid him the finest tribute when he described the Gamecock as his greatest plague. By this time, more than 30,000 cartloads of material and debris had been removed out of the city under the U.S. Army’s supervision, using more than 200 laborers and 50 teams of animals. The debris was dumped in the marshes as landfill. The splendid houses are all deserted, the glass in the windows broken, the walls dilapidated, the columns toppled over … arches demolished, mantels shattered, while fragments, great and small, of every description strew the floors … but where are the owners of these estates – where are they? 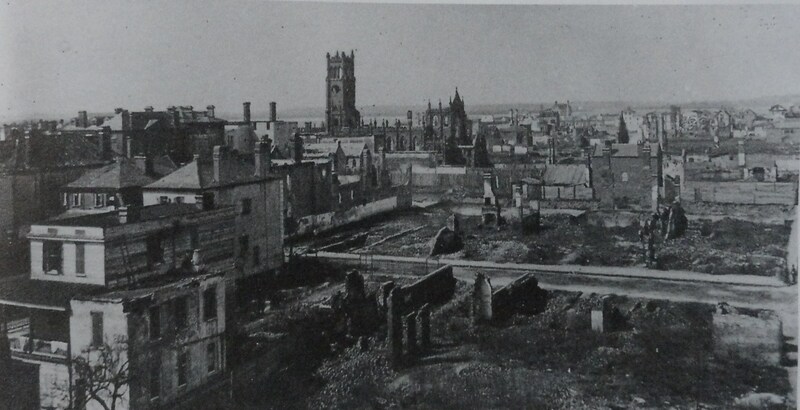 Charleston, after the War and fire destruction. The “Eight Box Law, written by Charlestonian Edward McCrady, Jr. and passed by the state assembly went into effect. The law got its name from the requirement that, on Election Day, there were to be eight separate ballot boxes for different offices. A voter had to be able to read in order to know where to place his ballot. At this time illiteracy rate among blacks was five times greater than whites. Another provision of the law was that every voter must re-register before June 1, 1882, or be forever banned from voting. This entry was posted in Today In Charleston History, Today In History, Today In South Carolina History and tagged Denmark Vesey rebellion, Joel Roberts Poinsett, Lord William Campbell. Bookmark the permalink.